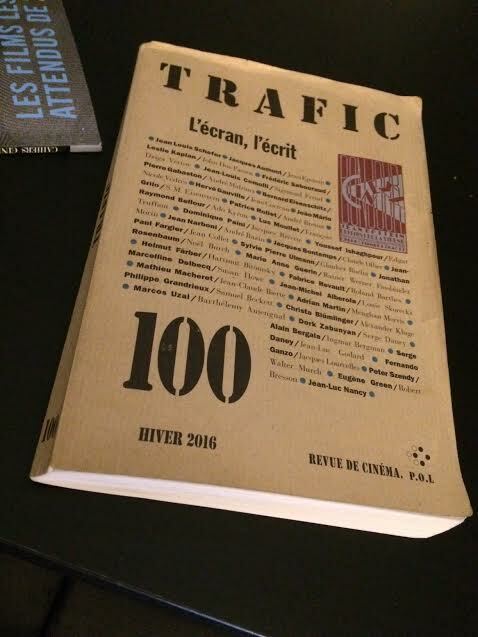 There’s a beautiful idea at the heart of the 100th issue of Trafic, which is to get thirty-six different writers to write their equivalent of Serge Daney’s Tracking Shot in Kapo – to reflect on an important essay or film book that has personally marked them. The issue is at its best when the essays are the closest to the original spirit of Daney’s journal: cinephile, erudite, personal, heartfelt and as Deleuze would characterize Daney’s thought, both optimistic and pessimistic. If Daney was able to reflect on his life and pinpoint Jacques Rivette’s On Abjection as offering a moral compass for his life, then these responses are too at their best when they conjure a life, morality and a way to live with the cinema. The issue proceeds chronologically from the foundational studies of the early twentieth century through the Occupation to the post-war period to the events of May ’68 all of the way the present day. This is an ethos that developed in the context particular to the history of French film culture. So Jacques Aumont joyfully imagines a conversation between Jean Epstein (whose Bonjour Cinéma graces the cover) and the Cinema screen, Jean-Louis Comolli goes in depth on the influence of Freud’s L’Avenir d’une illusion on his life and its appropriation to film analysis, and Pierre Gabaston writes about André Malraux and his importance. Two of Trafic’s committee member Patrice Rollet and Raymond Bellour both write on Surrealism through their essays on André Breton and Ado Kyrou. While the other two editors Sylvie Pierre Ulmann writes about introducing Glauber Rocha to France and Marcos Uzal on Barthélemy Amengual’s fine book on Jean Eustache. The essays work best when there is a sense of surprise to the choices and when the most obvious work by their authors are not the ones that are discussed. Though you can find Luc Moullet writing on François Truffaut’s Certain Tendency essay (perhaps already too commented upon, but the more Moullet the better) and Jean Narboni on André Bazin’s Montage, Interdit (one of his most famous essays), you can also find Dominique Païni on Rivette’s Lettre sur Rossellini and how it helped him both as a critic and programmer, Fabrice Revault meditating on his own film-going pleasures that parallel Roland Barthes’ in En sortant du cinéma, Jean-Michel Alberola on the relation between music and film spring-boarded from Louis Skorecki’s Contre la Nouvelle Cinéphilie, and Dork Zabunyan on how Daney’s essay on Federico Fellini’s Ginger et Fred articulated how he perceived Rome when he was living there. The essays on Claude Ollier and Jean Collet are also superb and the filmmakers Eugène Green and Philippe Grandrieux respectfully have essays on Robert Bresson and Samuel Beckett. The pleasure from reading these articles comes from how they offer new perspectives on previously read texts and how they create a desire to revisit them. They provide historical context about the earlier pieces and how they were received and how their meaning has evolved over time. The articles provide thoughts and understanding that go beyond their particular analysis. For example, Jean Louis Schefer in his letter describes the influence the bible had on the cinema (you can probably imagine a dozen classical Hollywood films based on its scripture), which for me was particularly resonant after seeing Martin Scorsese’s Silence whose testing of faith while the world is collapsing is another new example. A recently discovered Daney essay Godard, morale, grammaire analyzes the use of language in Godard films, which made me think of the complexity of language mixed with the disruption of social norms in the films of Matt Johnson. And if I had to play this game myself I would probably pick one of the following books: Peter Bogdanovich’s Fritz Lang in America, Raymond Durgnat's Films and Feelings, Annick Bouleau's Passage du cinéma, 4992, Don Owen's Captain Donald’s Quest for Crazy Wisdom or Zoé Bruneau's En Attendant Godard. One wonders what Daney would think of the journal, cinema or even of the depressing state of the world today? Zabunyan would highlight how Daney described the mannerism of the eighties as cinema’s second death, which implies that it would live through it and reemerge. The importance and continuation of cinema would be that there are still films that communicate a thought and which necessitate a rebounding, an engagement (to use of Daney's tennis metaphors) that would necessitate a response through film criticism. When I think of some films that illustrate some of Daney’s last ideas they would include the scenes in Joaquim Pinto’s What Now? Remind Me (which he has a cameo in, through archive footage) of the gay couple watching an old Hollywood film on their couch together or the utopian environmentalism of Sebastião Salgado in Wim Wenders’s The Salt of the Earth (Wenders being an early close friend to Daney). If there is anything a little disappointing with Trafic is that there is something non-unified about it and some of its different essays can appear to be contradictory. Other times it can be bland, obscure, too theoretical or set in its past views. In this particular issue some of the debated points throughout the essays include the merits of Bazinien realism, the fragmentation into groups, the respectability of cinema, and a hope for its future. Not that contradictions are bad or that the journal doesn’t have its own editorial position (which it does) but it's its constant return to its same old positions and polemics (with its stiff text-only format, which wasn’t always the case) that can sometimes be stifling. I would have also liked to have seen more on Stanley Kubrick or Alain Resnais in this issue (two of Daney’s favorite filmmakers) or a mention of one of my favorite film critics, Iannis Katsahnias. But as Trafic's full lengthy list of published authors at the back suggests, it does regularly expands its scope towards others and its project and history is quite impressive. The word ‘ensemble’ doesn’t have a good reputation these days. What’s fashionable instead is fragmentation and specialization that leads quickly to narcissism and shortsightedness. We learn quickly to find our place and to claim our territory. We learn to judge too quickly the pieces without seeing the ensemble. We must instead rise to the occasion and see that an ensemble exists. These days there is too much a focus on dividing people and thinking about the individual. Delorme at Cahiers and the Trafic team are trying to bring people together, allow for thought to develop from a group, and to unite through the cinema. A message that is even more vital now with every sad thing (and there are many) that is happening in the world. It’s good to think with others. This issue of Trafic illustrates some new ways of thinking about reading a text and opening up to the world to better understand how to live with films. So the big news in Canadian cinema these days is that apparently in the Don Owen archives there is a print - the only one - of the rough cut of his Ibiza party documentary Graham Coughtry in Ibiza (1971), which was never broadcasted. All Don Owen films should be made accessible and this one in particular seems like it could be one of his craziest - even wilder than Cowboy and Indian (1972) - as he, his friend and crew just live life to the fullest and have fun in Ibiza. For an example of one of his artist portraits see his Michael Snow documentary in the same series. I’m sure Graham Coughtry in Ibiza would be another perspective of the artist self-portrait and full of his regular improvisations and candor. Perhaps even it would prove to anticipate Pavan Moondi’s upcoming Sundowners? Part of the CBC Telescope series, Graham Coughtry in Ibiza is just one of many other Owen films that are not readily available. A list that includes Monique Leyrac in Concert (1966), Richler of St. Urbain (1970), Changes (1971), Holstein (1979), Partners (1976) and Turnabout (1987). Why does it have to be so hard to see these older images and films that are so vital to the history of Canada and its life and cinema? The following are two extracts about Graham Coughtry in Ibiza from Steve Gravestock's study of the filmmaker and Owen’s own memoir, Captain Donald’s Quest for Crazy Wisdom. – D.D. This surprising and awesome double-bill starts at 6:30PM on Thursday, January 26th at the TIFF Bell Lightbox. The Owen film will be free, as part of the Canada on Screen series, and will be introduced by Albert Ohayon from the NFB. There are some consistent themes that run throughout the work of the Toronto filmmaker Matt Johnson such as outsiders struggling against the system, megalomania dividing friendships, and failure as the end result. This raises the questions of what is the political strategy of focusing on these outcasts? What does it mean to show them in a negative perspective? And what hope can be interpreted from their failure? Johnson’s work in web-series and film so far include Nirvana The Band The Show (2007-2009), The Dirties (2013), Operation Avalanche (2016) and an upcoming follow-up to his original show, Nirvanna The Band The Show (now with two ‘n’s). This essay, through an analysis of the works, will illustrate how by focusing on people who are at the margins of middle-class society and by emphasizing their strangeness, Johnson is reorienting the norms of the dominant culture towards fantasy narratives that focus on struggle and defeat. These works are especially compelling in the context of the Canadian state-funded film industry whose vague idea of its demographics leads it to favor diversity and positive representations rather than being truthful and entertaining. Johnson’s mixture of guerrilla filmmaking along with unrestrained textual poaching provides an example of how society is oversaturated with media and the effects of a cultural identification with it. Johnson finds a way to work within the system of relations of dominant 21st century media to then co-opt it through appropriation and parody to dismantle its power and authority from within. Johnson’s work is characterized by a youthfulness and delinquency. The characters that populate his worlds at first try to fit in and adapt to social norms before it leads them to conflict and rejection. There are the amateur musicians in Nirvana The Band The Show (NTBTS), the bullied teens in The Dirties and the audio/visual department of the CIA in Operation Avalanche who all share a desire to fit in and assimilate but through their struggles end up being rejected by the social groups and institutions that they want to be a part of. The main protagonists in all of the works take up the question of social participation in different ways. Matt and Jay in NTBTS just want to play a show at a nearby concert venue, Matt and Owen in The Dirties do not want to get bullied at their high school, and Matt and Owen in Operation Avalanche want to help their country the United States win the Space Race (the film is set in 1967). These characters provide different models of the outsider from that of the loafer, the psychopath and the idealist. In all three cases, there is a desire to adapt to the norm which is always crushed and rejected by larger social forces. To use Carl Schmitt’s definition of the political, that of the distinction between friend and enemy, in NTBTS the Matt and Jay characters represents loathers, slackers and resistors to the dominant capitalistic order of social progress and economic growth. Their idleness and scheming defy a neoliberal pursuit of the common good. The two, who are in their mid-twenties (perhaps the most suited time for this kind of behavior), do not try to integrate as they avoid participating in the labor market to instead focus on their imagination and dreams. The show and Johnson’s work is not that of the politics of inter-state relations – such as the work of government, social and foreign policy – but more so that of intra-state. NTBTS antagonizes the social by privileging the youthful and non-socially useful. If there is an enemy to the state it is the irresponsibility and recklessness of these young adults that consistently undermine it. The two bands that the show’s title directly alludes to – Nirvana and The Band – might give a better example of the politics it expresses. Kurt Cobain’s anti-mainstream sentiments and grunge attitude is one major influence. The iconic Nirvana song Smells Like Teen Spirit (1991) appears twice throughout NTBTS: once over the season’s end credits and then as the ‘encore’ of their live post-season show at The Rivoli. Johnson takes Nirvana’s counter-culture lessons to heart as he plans his own youthful revolution – what would it look like if the Millennials took over and created their own institutions? It would have a punk aesthetic absorbed in the popular culture of the eighties to the present. It would define itself by the communities of young friends, who were formed in front of screens and in their parents’ basements, trying to find ways to subvert their upper middle class upbringing. Alternative music with its melancholy and defiance would offer one remedy. Just like the Nirvana song, the Matt character in these works struggles with his enthusiasm and melancholy as they conflict. 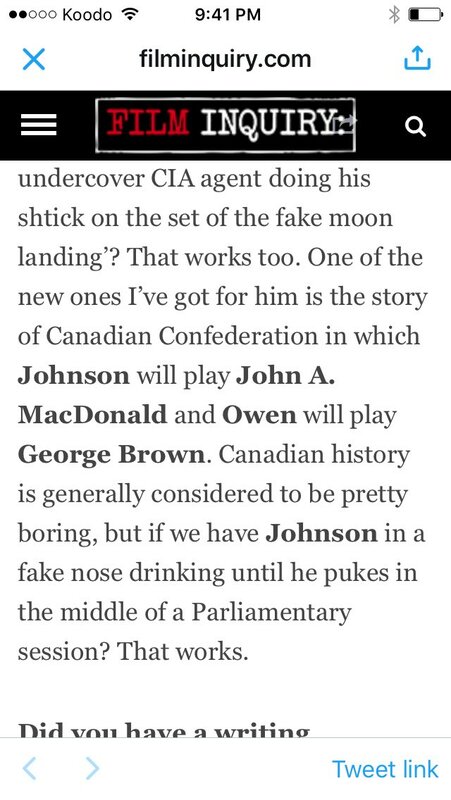 While Ronnie Hawkins from The Band, who appears in episode eight The band of NTBTS, provides another example. The mixture of old country music with early rock in The Band’s songs conjures nostalgic images of an earlier world and creates strong emotional affects that both saddens and uplift. 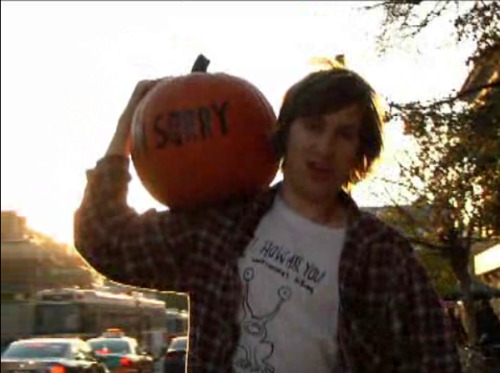 Another example is episode seven The battle of the bands where the Smashing Pumpkins song Tonight, Tonight (1995) plays a big role to set the tone of their characters’ mood while also anticipating a literal pumpkin smashing scene. Matt also wears a Daniel Johnson t-shirt in that episode. The reoccurring motif of melancholic musicians is a symbol of their permanent adolescence and how they are content to rejoice in their friendship, struggles and failures. Where the cinéma vérité style of NTBTS is closer to the fly-on-the-wall approach of The Office (2005–2013) and the adventures through urban spaces of Flight of the Conchords (2007–2009), in The Dirties the conflict and filmmaking in a real high school is closer to Chris Lilley’s Summer Heights High (2007) and the surreal documentary-like footage of a psychopath in Man Bites Dog (1992). The Matt character also continues to resemble Kurt Cobain through his grunge wardrobe and reckless behavior. 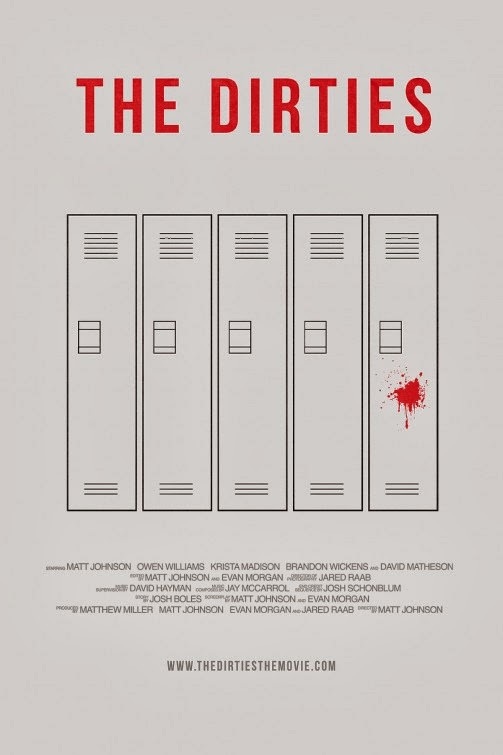 The Dirties is the story of two film-obsessed teenagers who plan a revenge plot to kill the bullies at their high school. The two friends are the happiest when they are together but as time goes by and Matt seriously wants to follow through with his plan, Owen (Owen Williams) starts to distance himself from him and spends more time with his new crush Chrissy (Krista Madison). 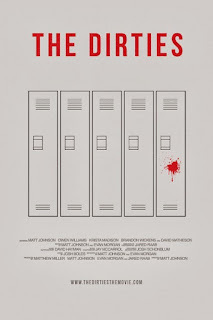 The Dirties was a controversial film as it was critiqued as being irresponsible for not taking seriously its subject and that it might inspire future school shootings. But what it does instead is create an expression for youthful concerns that are not usually discussed. The frightening quality of The Dirties is that Matt’s problems and alienation are relatable. The Dirties stands out for focusing on the uncomfortable and dangerous territory of adolescence that tends to get overlooked. It shows the embarrassment of being bullied at school, games and popular culture as an escape from reality and the rationalizing of dangerous obsessions. The Dirties shows a darker side of humanity but presents it unflinchingly. It is effective for showing the problems of youth and creating empathy for its characters while also being repulsed by what he does at the end. The uncertainty in the response to the film partly came from the fact that Johnson also starred in the film, which blurred the line on whether you were seeing his own thoughts and actions or that of the characters. In one scene of The Dirties Matt leaves his classroom when all of his peers are laughing at the film that he made, though he keeps looking on through the door window. This scene is described in the audio commentary as being inspired by an Orson Welles anecdote from one of the F for Fake (1973) DVD special features where he describes walking out of a The Magnificent Ambersons (1942) projection just to peek into it from outside of the room’s door. With The Dirties Johnson started taking on and including more of film history into his work, which has only been increasing since. And as a multitalented filmmaker, who started at a young age and who stars, writes, directs and edits the director Welles was one of his models. A film like Citizen Kane (1941) provides a major reference point. Just like how Welles’ first film antagonized one of the most popular figures in America of his time William Randolph Hearst. Here Matt takes a sensitive topic and uses it to study the mind and character of a school shooter but also to get the sensational media attention and response that goes with addressing a taboo subject. Just like how Welles used his film as a form of critique and to spark controversy, so does Johnson with The Dirties. Similar to how Welles rooted his film in the real world and blurred non-fiction with fiction through the newsreel that opens Citizen Kane, Johnson uses a similar technique by starting The Dirties with documentary footage set in a school on the problem of bullying. Another filmmaker would also use the same technique. Stanley Kubrick does this with the Cold War nuclear scare when he made Dr. Strangelove or: How I Learned to Stop Worrying and Love the Bomb (1964). He took the public fears of the nuclear conflict between the United States and Soviet Union, and made a dark comedy on this subject – an air force general becomes paranoid over subversive Soviet infiltration so he orders the first nuclear strike. The end credits of The Dirties anticipate Operation Avalanche. Within its compilation of classic opening film credits there are three from the films of Stanley Kubrick: Dr. Strangelove, 2001: A Space Odyssey (1968) and The Shining (1980). Just like how The Dirties could have been made from a newspaper headline about a delinquent teen, Operation Avalanche could have been conceived in online conspiracy forums in the wake of the The Shining documentary Room 237 (2012). The premise of Operation Avalanche is that since the Americans could not win the Space Race, they instead arranged for the audio/visual department of the CIA to find a way to fake it. The two of them Matt and Owen go visit Kubrick on the set of 2001, and inspired by his use of front-screen projection, they are able to fabricate footage of a moon landing. Eventually higher officials at the CIA turn against them, kill Owen, and Matt has to blackmail them about their corruption to survive. It is a preposterous story but it fuels the popularity of its conspiracy narrative and convincingly critiques the power and malleable quality of images and the coercion of powerful institutions that use them. Similar to the film Wag the Dog (1997), about a film producer that fakes a war to help the American president get re-elected, Operation Avalanche is about the power of images to change society, regardless of their authenticity and for what ends. After being an idealist who wanted to help his country and make a difference, those in charge started to mistrust Matt and the whole conspiracy got out of hand. It is Johnson’s most direct and critical film about institutions and their coercion. After an earlier idealism comes resignation. And one wonders what his character is going to do next? Operation Avalanche is also a victory for Johnson for bringing his cinéma vérité style to a period film and have it be pulled off successfully. It is quite surprising how the independent film was able to pull off the look of the sixties while being filmed in contemporary times. The special effects and archive footage are seamlessly integrated. There is an ambiguity to its form as it celebrates the creativity of image making while criticizing its abuse. It is worth noting some of the differences between Johnson’s serial work and his films. The films both cast the more serious Owen Williams in the friend role. Williams is more introverted than Matt, less likely to follow him in the extremes of his adventures, usually turns away from him and then suffers the most due to their friendship. While Jay McCarrol, who works in the music industry and is in the popular band Brave Shores, is cast as the friend in the two versions of the show NTBTS. McCarrol still plays the straight man to Matt’s joker, but he is more exaggerated and silly than Williams and his musical skills add an extra lyricism to his performance. There is also a difference in the tone and form of the feature films and the show. The feature film with its long format necessitates a consistency in its story and for a singular style to be stretched for a sustained duration. 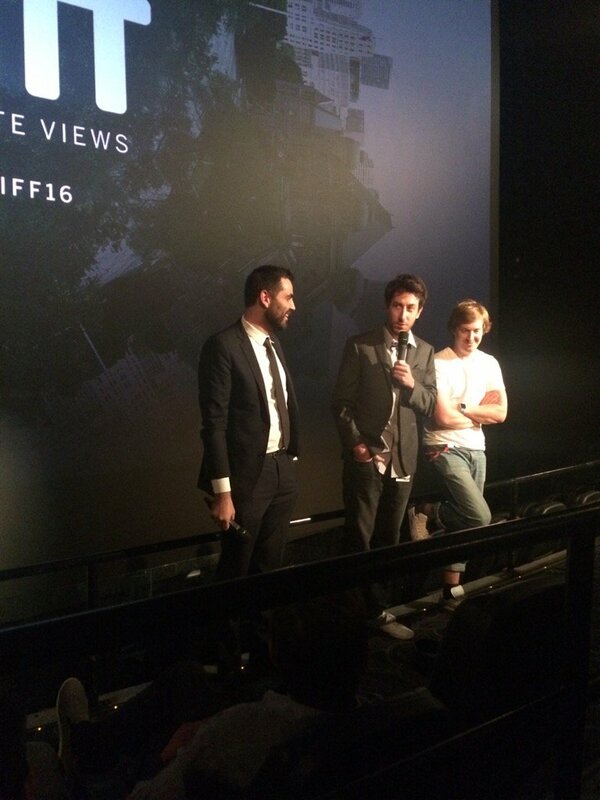 The feature film encourages straightforward storytelling, continuity in performances, and sustained character arcs. While for the show the episodes, with their shorter format, allow for more experimentation. They are testing grounds to try to recreate famous movies and shows, suggest references and to find novel ways to have adventures in Toronto and beyond. They can engage in more TV tropes and non-sequiturs. Johnson’s references to Canadian cinema might be the most extensive out of the new generation of young Toronto filmmakers. For example, he cited Don Owen’s Nobody Waved Good-bye (1964) as contributing to his style. Though there are many points of comparison between Nobody Waved Good-bye and Johnson’s cinema, it resembles the most NTBTS for its independent approach to tell a story of youthful rebellion in Toronto. Don Owen’s film is one of the breakthrough Toronto-set and English-language Canadian films. 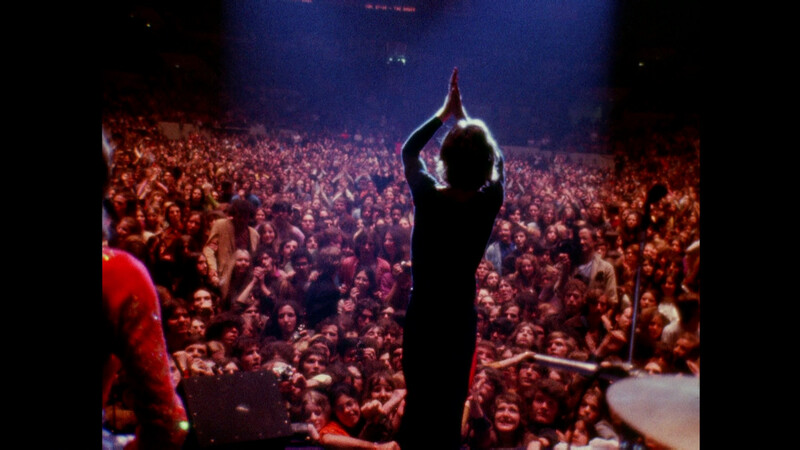 While much of Canadian film history is rooted in documentary, Owen’s film marks the transition towards hybrid documentary-narratives that brought Toronto and its youth to Canadian screens. 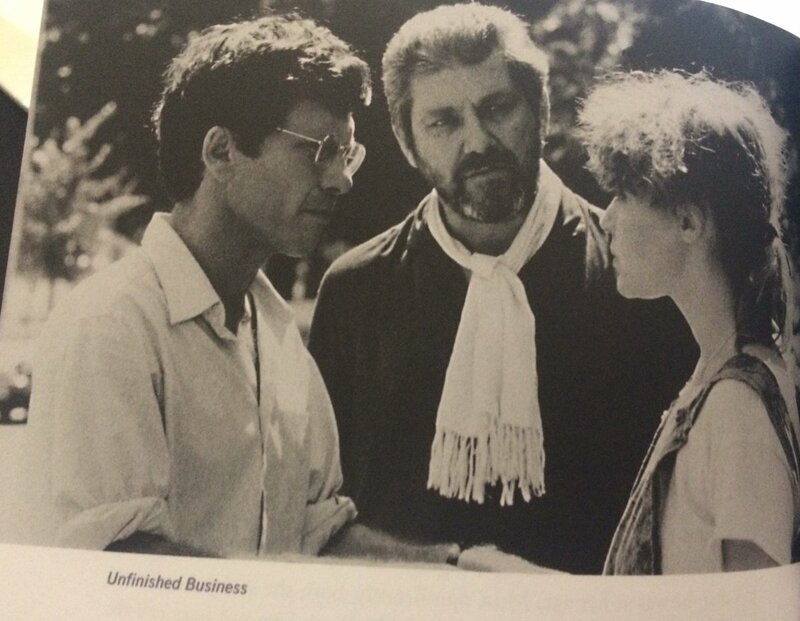 A charismatic and rebellious Peter Kastner’s plays a thinly veiled version of both himself and Owen. Johnson brings up the importance of the scene in Nobody Waved Good-bye where Kastner is working at a parking lot and surprises the customers by having regular conversations with them without them knowing that they are being filmed. The reference point reaffirms Owen’s importance to Canadian cinema and highlights this hybrid approach of documentary mixed staging as one of the central characteristics of Canadian filmmaking. 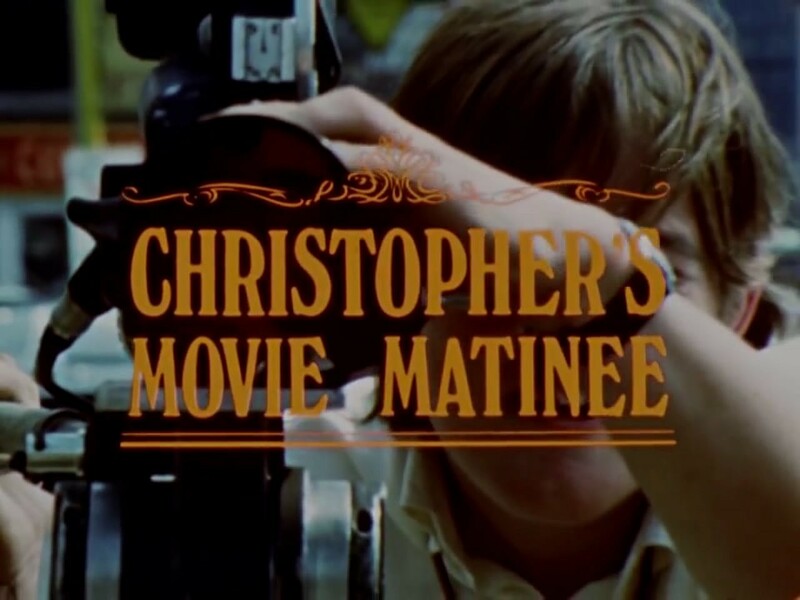 In Operation Avalanche Johnson includes insert clips from Mort Ransen’s Christopher's Movie Matinee (1968), though its inclusion is more than just a simple insert. The spirit of Christopher’s Movie Matinee clearly inspires Johnson’s work. This radical sixties documentary tells the story of teenagers and hippies who get National Film Board cameras to do whatever they want with them – from goofing off with their friends, recording random footage, discussing what they are going to do, attending anti-war protests, and discussing the values of youth culture with city council members. Again, a surprising referential discovery that highlights the history of filmmaking on Toronto’s streets and capturing unexpected encounters between youthful rebellion and an older generation. Johnson, through these references, is creating his own pantheon of the important filmmakers that have contributed to the evolution of style of the national cinema. 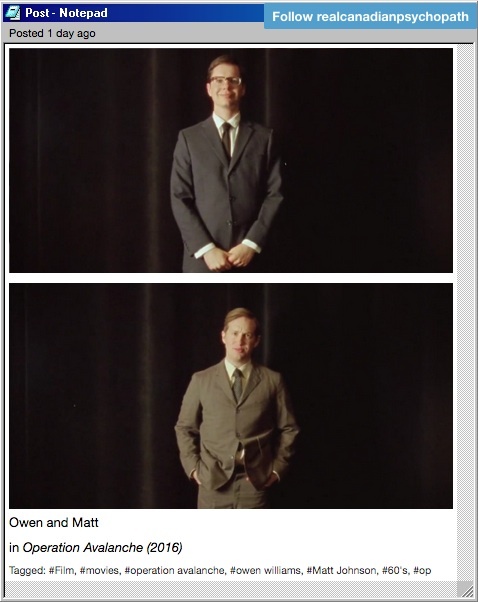 These homages to previous Toronto filmmakers take place through discussing their influences, emulating their style, copying shots, and including their footage. By doing this he presents a lineage of evolving representations of Toronto that was created by youthful perseverance. Johnson has been quite public about the problems with the Canadian state-funded film industry. As it stands currently, it is a fragile risk-adverse market for both production and exhibition, and whose measurements of success are not clearly defined. The funding institutions favor the safety of funding already established talent. An organization like Telefilm is not interested in quality, creativity or even representations of the city per se. Its pre-production process instead selects for grant form application know-how and the necessity of networking. These are just some of the problems that Johnson has critiqued the Canadian film funding system and which has led to a David and Goliath-like public fight. By doing this he is connecting his advocacy for filmmaking in Canada with the themes in his films. His films themselves offer potential solutions to many of the problems plaguing the industry here. They are examples of how to create entertaining media in an affordable manner while proudly showcasing the city. Johnson’s creates an image of Toronto that starts with the real – real places, people, and events – through a documentary style. Their small filming crew goes out into the streets and film but they bring to it a sense of imagination and wonder through their stories and humor. Instead of news style reporting, Johnson’s approach, with its conspiracy tone, brings the viewer more into the heart of the public life of Toronto. The upcoming NTBTS for Viceland will indulge in this more so than has his previous works. Johnson’s fourth, largest, and most funded project wants to make Toronto one of the main characters in the series. Here are some examples of some settings and events from the upcoming season: Yonge and Dundas during the marijuana craze 420, Canada’s Wonderland, the Sickkids hospital, the Santa Claus Parade, FanExpo, the premiere of Star Wars: Force Awakens at the Scotiabank movie theater, a public fight at a famous Chinatown restaurant, and a fiery sensation on Queen street West. The unpredictable nature of the NTBTS adventures has the ability to transform unnoticed areas of the city into centers for imaginative narratives and schemes. But Johnson’s work engages more explicitly with an Americanized mainstream popular culture and does not neatly accept these specialized Canadian references. But still, perhaps as a surprise, he might relate more to the free spirit of nineties Canadian cable television hosts of shows such as YTV and Much Music. There is a preference in Johnson’s work to focus on the lowbrow culture and as such he would rather side with someone like PJ Phil than an already canonized director. For example, Johnson’s ethos is closer to someone like the program jockey Phil Guerrero who was the regular host of the after school teenager show The Zone in the early 1990s and later Gamerz (1998–2000). This is essential part of Johnson’s project: to stay loyal to the popular culture that he grew up with whether it is a popular film, show, videogame, book or song and to breathe life into it again by filming it with respect, especially if it has been disreputed or forgotten about. The identification with mass culture in Johnson’s work is closer to the populism as described by Ernesto Laclau and Meghan Surtherland than it is to that of Siegfried Kracauer or Guy Debord. Popular culture is everywhere in NTBTS and The Dirties from movie posters on the wall, characters watching and playing video games in front of screens, and dialogue made entirely of references. Though the world it portrays is one that has been turned into an image and of spectacle, mass culture does not necessarily instill a relationship of a passive engagement or blind acceptance but instead becomes a means to define oneself, one’s peers and becomes a source of play and transgression. Because a mass heterogeneous population can identify with popular culture it can unite different social groups into one community and articulate their concerns – this is the voice that is articulated throughout Johnson’s work. The relations to mass culture get transformed in Johnson’s work through spectatorship and action. Here are some specific examples of how popular culture is intergraded in Johnson’s work: In NTBTS the incoming call background picture on Matt and Jay’s cellphone is of each other recreating an iconic look from Calvin and Hobbes; in The Dirties Matt references that he is just like the child detective Encyclopedia Brown when he is measuring his locker, and the late night bike ride is described as a homage to Spike Jonze’s music video for Arcade Fire’s song The Suburbs (2010); in Operation Avalanche on their office wall there is a poster for Otto Preminger’s Anatomy of a Murder (1959). However fleeting the references are, among so many others, they make sense for the characters and contribute to the larger themes of the work. Just like the rapport between Abed and Troy in Community (2009–2015), in Johnson’s work the inside jokes and references create an identification as they mean something to the characters and the worlds that they inhabit. For the characters they are a source of pleasure as they allow for a temporary relief from their lives. This camaraderie and referentiality extends to the paratext of the work as the DVDs include numerous audio-commentaries where in some of them all they do is discuss the references and their personal meaning. It is the recognition of the reference that creates an identification and it is the camaraderie that then creates its affective dimension. This is for Laclau how populism functions. Johnson takes the routine and habit of living in a media saturated culture and transforms and negotiates its meaning to undermine a unidirectional power relationship. For example, when the new NTBTS played in the Primetime section at the Toronto International Film Festival in 2016 it unnecessarily included the TIFF specific L'Oréal commercial to parody the commodity fetishism of its original purpose. Johnson’s work has a fan fiction quality as he takes these popular forms and references and reanimates them into his own work. 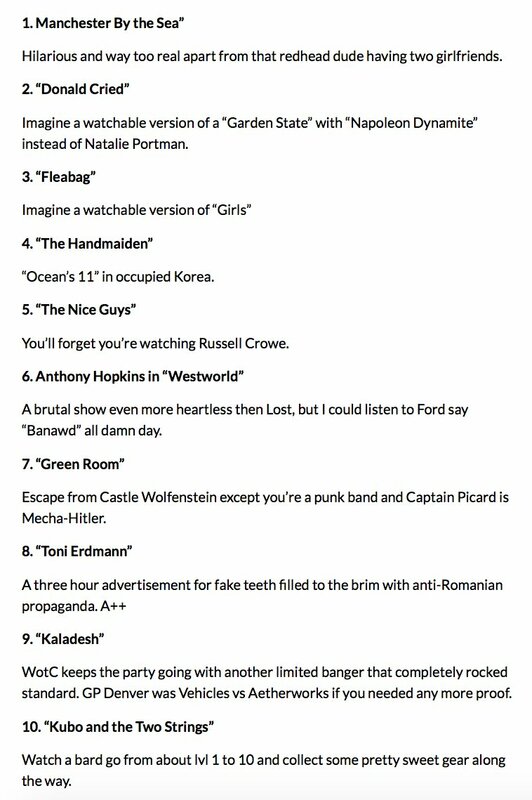 The parody openings of classic television shows at the beginning of each episode of NTBTS is an example of this. There would be the problem of copyright infringement in including so much of this material. But with the increased power of fair use laws, the transformative nature of the appropriation, that the work skirts the line between documentary and fiction, and with the help of a good team of lawyers this has led to the wider circulation of textual poaching in media. Other prime examples of digital media that benefitted from the rise of fair use to overrule possible copyright infringement lawsuits include the Banksy documentary Exit Through the Gift Shop and Escape from Tomorrow (2013) who both have scenes set on the private property of Disneyland; and the monumental collage films like Jean-Luc Godard’s Histoire(s) du cinéma (1988–1998) and Thom Andersen’s Los Angeles Plays Itself (2003) that are now finally being able to be released on DVD after many years where their audio-visual citations prevented them to be. Even though the social demands of Johnson’s work are not radical – they are not positing a full communist revolution, for example – they still offer a critique of the restrictions and demands in a neoliberal society in favor for the possibility of freedom, imagination and dreams. 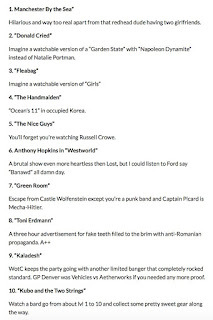 Their use of the identification with the populism of spectacular entertainment plays a large role in their representation of a 21st century media consumer and shifts this position towards one of transgression. Though Johnson’s work does not call for any specific social need or political plan it instead calls for the fulfillment of personal desires such as to value friendship, to find better ways to experience your surroundings, and to be skeptical of powerful institutions. It reaffirms the value of a youthful idealism and proposes a more positive way to engage with popular culture. There is an ambivalent nature to Johnson’s project. It is emancipatory in giving a voice to outsiders whose negotiating use of popular culture critiques the status quo of neoliberalism. Filmmaking for Johnson becomes a way to engage with others and the larger Toronto community, to see and experience life, and to record and show it to the world. There is a beauty to this gesture, as filmmaking becomes a way to get closer to others and to let them be and speak for themselves. One great example of this is the beginning of The Dirties where Matt sparks a conversation with two kids in the park who themselves are aspiring filmmakers. Just being out filmmaking in the street for Johnson alters the surrounding reality and creates surprises and shifts perceptions. 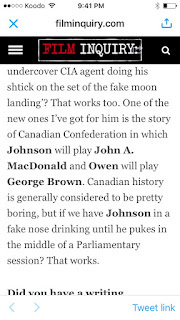 This focus on outsiders might eventually shift in Johnson’s work as one wonders what he might do with his upcoming biopic on the Canadian Prime Minister John A. MacDonald. But there is a pessimistic side to Johnson’s work. His production company is called Zapruder Films (whose team works just as hard as he does to pull off all of these projects) and there is something about that reference that seems apt in regards to his work. It conjures the death of John F. Kennedy, conspiracy and public murder entering the mainstream consciousness and a loss of innocence. But the content of the Zapruder film brings to mind another similarity to Johnson’s work, which is that they all end with deaths. Matt shoots Vince Valence at the end of NTBTS, Matt kills the bullies at the end of The Dirties and Owen gets killed at the end of Operation Avalanche. Johnson seems to be including the own limitations to his project in his work and the risks and failures of a group of friends going up against powerful institutions. There is a real fragility to Johnson’s endeavor as even to capture and sustain such a light-hearted mood they seem to be putting their lives on the line and risking a lot. To make their work they are performing dangerous stunts, breaking laws, burning bridges with the industry and putting themselves at risk of lawsuits. Is the controversy of their work going to pay off and have an effect? Will they be able to create a real change? Will they be able to recover if they get burnt? It is too soon to tell but perhaps one positive aspect of all of this is that even if they fail they can always try again and keep working at it.